Timberlake, NC (September 16, 2004) Late Model Stock rookie Tracey Chambers has been invited to attend the Lyn St. James Driver Development Program to be held in Phoenix, Arizona. The program will run December 8 -12 with events at Phoenix International Raceway. The program is designed to provide drivers with the necessary tools, as well as help prepare them for a successful career in motorsports. Tracey stated, "It is a great opportunity to be invited to attend such an honorable program. I am excited and looking forward to working with Lyn." 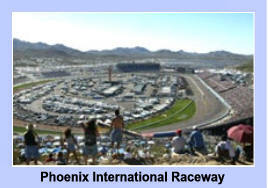 The program focuses on the business of motorsports and includes on track activities at the one mile Phoenix Raceway. Only a select group of drivers are invited after resumes are reviewed for experience, success, and racing potential. Lyn St. James was just the second woman in history to race in the Indy 500. She took eleventh place, and became the first woman to be selected Indy 500 Rookie of the Year. Fueled by inspiration and limitless motivation, Lyn St. James managed to rise through the ranks and eventually become known as the American Woman Racing Icon of the Century. She is undoubtedly a testament to the power of determination and positive thinking. Past graduates of the program include Danica Patrick, Jason Jarrett, Sarah Fisher, and Erin Crocker.